FOR third match in a row Dumbarton suffered a one goal defeat, this time losing 2-1 at home to improving Queen of the South. FOR third match in a row Dumbarton suffered a one goal defeat, this time losing 2-1 at home to improving Queen of the South in front of an 852 crowd. On a really cold day at the Cheaper Insurance Direct Stadium Sons failed to give departing assistant manager Stevie Farrell a farewell victory, but it was close from start to finish. Christian Nade brought Sons back into the game on the hour mark after going behind to a first period strike from Queens on-loan Motherwell midfielder Dom Thomas. An Andy Stirling shot came back off the bar, and the big striker stroked home the rebound. However the Palmerston star scored again on 68 minutes to give the Doonhamers a win that puts them seven points ahead of Dumbarton in the Ladbrokes Championship, though Sons did have chances in the closing minutes. It was a disappointing end to the game which had started well for Sons. 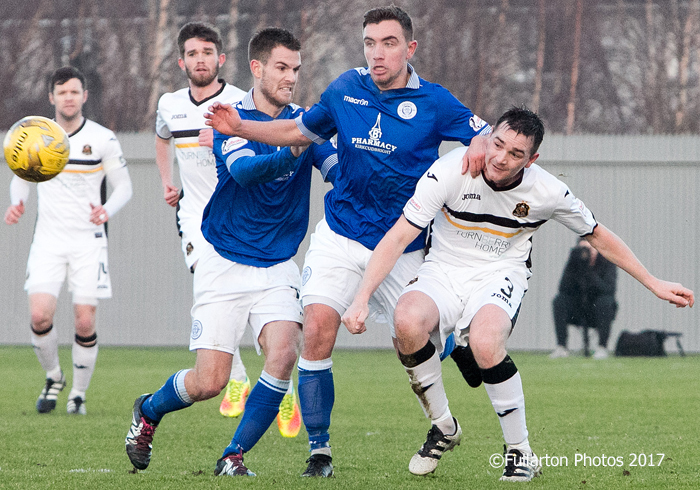 The picture shows Mark Docherty beating ex-Son Joe Thomson to head forward.